In a report by ETNews highlighted by PhoneArena, Samsung Display is said to have started preparations with its supply chain partners to produce new OLED iPhone screens starting from May. The manufacturer's A3 production line, which was allegedly shut down earlier than expected due to supposed issues with iPhone X display inventory, will be reactivated for the new orders. A report from early March claimed Samsung's 2018 operating profits derived from displays would be below analyst estimates, due to lower than expected sales of the iPhone X. A February report alleged Samsung reduced the OLED panel output from its South Chungcheong plant by half, producing 20 million or fewer displays for the quarter ending in March instead of the 45 to 50 million originally anticipated. Suppliers of display-related components are also supposedly awaiting the upcoming production increase, with the new work helping to counter the effects of the seasonally-weak quarter. The capacity utilization rate rise for the Samsung Display plant should in turn help improve the performance of partner companies supplying items for panel construction. The report claims it is unclear exactly how many panels will be made, with an industry official quoted as saying "We have not been notified of the quantity of production. We are looking at the market atmosphere and we are expecting the amount of production." Even though one report points to the imminent start of production, another from The Bell suggests that Apple and Samsung Display have yet to finalize a manufacturing deal. The two companies are apparently still negotiating the price, though it is thought to be lower than last year's per-panel cost. Apple is said to be looking for a lower price instead of increasing volume, reducing cost from economies of scale, meanwhile Samsung Display is apparently considering the cuts due to its declined capacity utilization rate. Samsung Display CEO Lee Dong-hoon reportedly met with Apple executives on a US business trip last month, but the matter was not finalized at the time. The revelation that Apple and Samsung have yet to finish negotiations goes against a March report claiming the two had reached "satisfactory terms" for OLED production that will prevent the cost of the panels from rising. The apparent agreement was made despite Samsung Display's stronger negotiating position, due to Apple supposedly reducing its OLED panel order from what it previously committed to buying for the iPhone X. 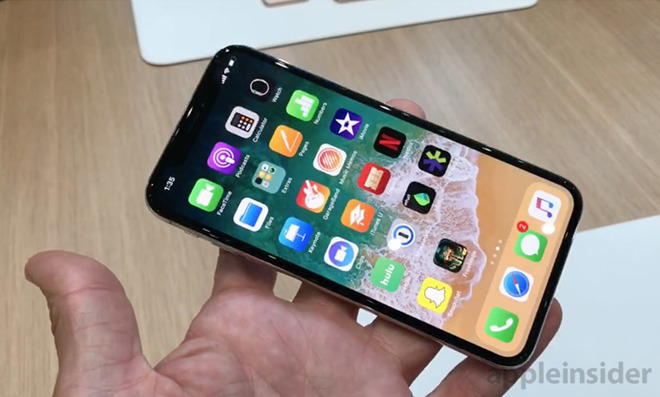 Current speculation suggests there will be three iPhone devices shipping this fall, consisting of a 5.85-inch OLED model alongside a 6.45-inch model and a 6.1-inch LCD version. While the figures vary between reports, it is believed Apple will be ordering between 100 million and 130 million OLED panels destined for iPhones across 2018, with OLED making up roughly half of Apple's entire display panel orders across the year.